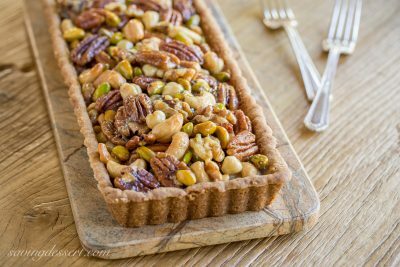 Bourbon & Butterscotch Nut Tart -Assorted nuts are coated in a smooth, creamy butterscotch sauce with just a hint of bourbon then baked in a delicious pecan shortbread crust. I glanced at the calendar and suddenly realized today is my 5-year blog anniversary (a/k/a blog-iversary). I can’t believe it’s been five years and I’m still consumed with a desire to do more. It started out as a hobby, a way to document my favorite recipes, and to learn how to use a camera. Don’t look too far back – I’m embarrassed at some of the stuff I posted in the early years, but it’s a history and that’s something we cannot change. At this point blogging is more than a hobby, it’s a passion. So … since it’s a special day here at SRFD, do I get to make a wish? Maybe I shouldn’t tell you what I wished for or it won’t come true – but if it does you’ll be the first to know! Do you have a favorite nut? 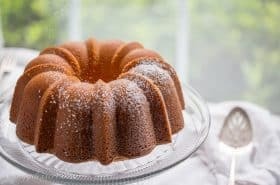 Do you crave butterscotch and enjoy a little bourbon on the side? Look no further, this is the dessert for you! This has been in my head for months … I could see it, smell it, and taste it, and couldn’t rest until I put it on the table. It’s just a coincidence I posted a butterscotch recipe and a soup recipe last week, then again this week. But this one has nuts, lots and lots of nuts. Walnuts, pecans, hazelnuts, cashews and pistachios. These are my favorites but you can mix it up with as many or as few as you like. Each bite is a little different but all are covered in a smooth, creamy butterscotch sauce that takes minutes to make. The simple tart crust can be made ahead and comes together easily in a food processor. Serve at room temperature for the best texture. 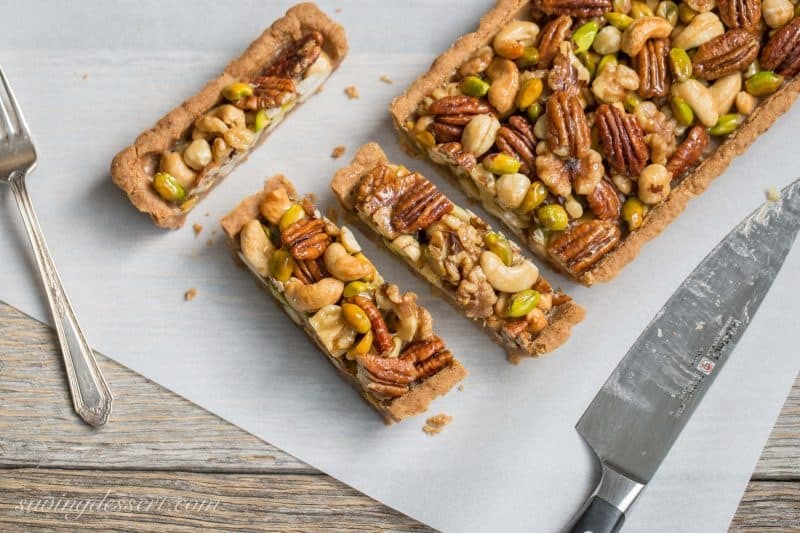 Assorted nuts are coated in a smooth, creamy butterscotch sauce with just a hint of bourbon then baked in a pecan shortbread crust. To make the crust: Add the flour, salt, sugars and pecans to the bowl of a food processor. Pulse to blend. Add the butter and process until a soft dough starts to form. Do not over mix. Spray the bottom and sides of a 14” x 5” tart pan with a removable bottom. Press the dough evenly into the sides and bottom of the pan. Freeze the tart crust for 30 minutes. Prick the bottom of the tart with a fork. Line the tart with a piece of parchment paper and lightly fill with dried beans or pie weights. Bake for 25-30 minutes or until the crust starts to set. Remove the parchment and beans and bake for an additional 10 minutes. Set aside to cool. To make the tart: Preheat oven to 350 degrees. Melt the butter in a large heavy-bottom saucepan. Add the sugars, salt, water and corn syrup. Heat over medium-high stirring constantly until the sugars dissolve. Bring the mixture to a boil, reduce the heat to medium and and cook for 5 minutes, stirring constantly. Once the mixture thickens and creates slow thick bubbles, remove from the heat. Whisk in the cream and vanilla, taking care as the mixture may sputter. Gently stir in the nuts and pour the mixture into the prepared tart pan. Bake at 350 degrees for 15-20 minutes or until the filling bubbles. Cool completely on a rack. Serve at room temperature. 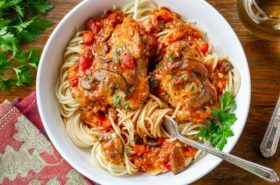 Double the sauce recipe and refrigerate half for other uses. Great drizzled on ice cream, apple pie or brownies. Top with a sprinkle of fine sea salt if desired. This blog wouldn’t be any fun without you. Thank you so much for your faithful visits, encouragement, comments, pins and shares. 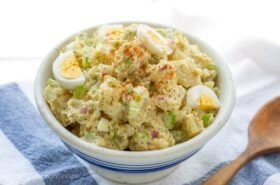 I love hearing about the recipes you’ve tried and welcome your feedback. If you’re new to Saving Room for Dessert, please join us by signing up for email notifications of new posts, follow along on Pinterest and check out our Facebook page. We promise to keep the recipes fresh and new, some healthy and a few indulgent, but mostly fun and simply delicious! Thank you so much for stopping by and thank you for sharing part of your busy day with me. You are the best virtual friends in the whole world! Forgot to say- Happy Blogiversary! Kudos to you, you have a great blog! Oh my gosh, this is over-the-top goodness, Tricia! I love all those flavors, everything is better with a little bourbon! 🙂 I need to find that tart pan soon! Thanks for the recipe! Five years of blogging is huge, Tricia! Congratulations!! I’m so glad I’ve gotten to know you through this awesome world of blogging. As always, your photos make me wish once again that we were neighbors. It would be so much fun to sit down and share this tart with you and Sue. Thank you so much Mary – you are such a dear sweet person – I am thrilled to be your friend 🙂 I talk about you all the time – your great recipes, what a great mother you are, the amazing work you do for those in need and the food bags you give to the homeless. It’s all a wonderful testament to the fabulous person you are. We would be such great neighbors! Thanks for commenting and stopping by! Congratulations, Tricia, for 5 years of delicious recipes, wanderlust inducing travel logs, beautiful photos, and virtual friendship. Whatever your wish might be, I hope it comes true! I am a nut lover! I can easily have a small handful of pecans or walnuts for a light lunch along with an apple or pear. I feel sorry for those who have nut allergies or digestive issues that preclude nuts. 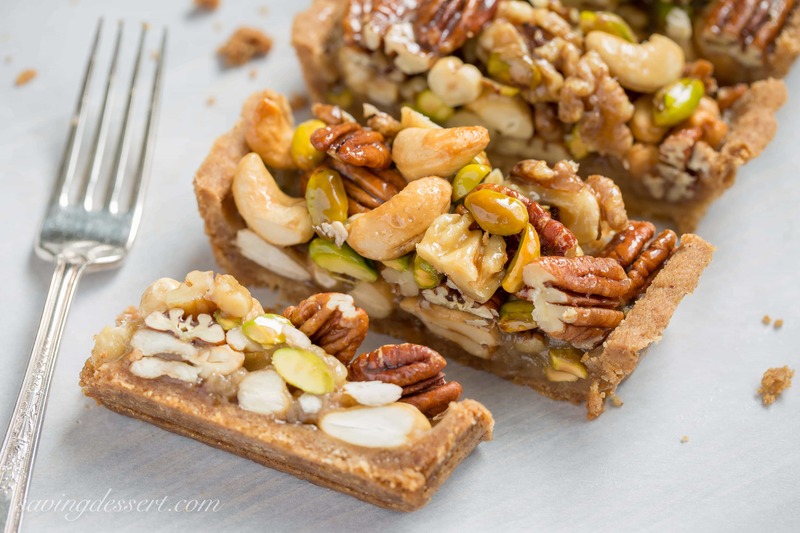 This tart looks like a nut-lovers’ dream dessert, Tricia. 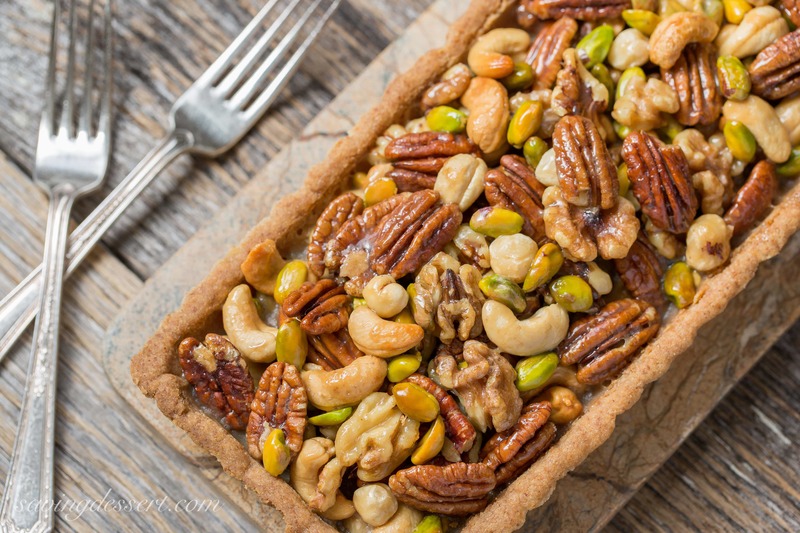 I think you picked the best nuts for this amazing tart! You are so right Susan – I can’t imagine life without nuts – for lunch or as part of the family – nuts are amazing! Hope you are having a wonderful weekend. Thanks for stopping by! You’re never late Jennifer – always perfect timing 🙂 Thank you so much – I guess you know what I’m wishing! Just look at that pile of nuts! This desert made my day. There are not enough nutty desserts in this world. Thanks June – there is just enough butterscotch to hold the nuts together and the flavor combination is wonderful! Happy Blog Anniversary, Tricia! The tart looks splendid. I love it’s loaded with NUTS. Tricia, this is truly a masterpiece! Bourbon and butterscotch sound like a match made in heaven. Only you could make a bunch of nuts look so gorgeous! It’s perfect for celebrating a milestone anniversary. I’m so happy you started blogging and have loved getting to know you and seeing your blog thrive. You have so many gifts and they are truly being used right here in the wonderful place you’ve created! Wishing you many more years to come! Thank you so much for the sweet note Chris 🙂 You are an inspiration and an all around lovely person! Wow Tricia- 5 years?! I appreciate all the work you put into your blog. It is truly gorgeous, as is this tart. Nuts and butterscotch and bourbon-I don’t know what’s more incredible- this tart or 5 years! Here’s to 5 more! Thank you Abbe! The nuts and bourbon and butterscotch are all so happy together – a perfect marriage! 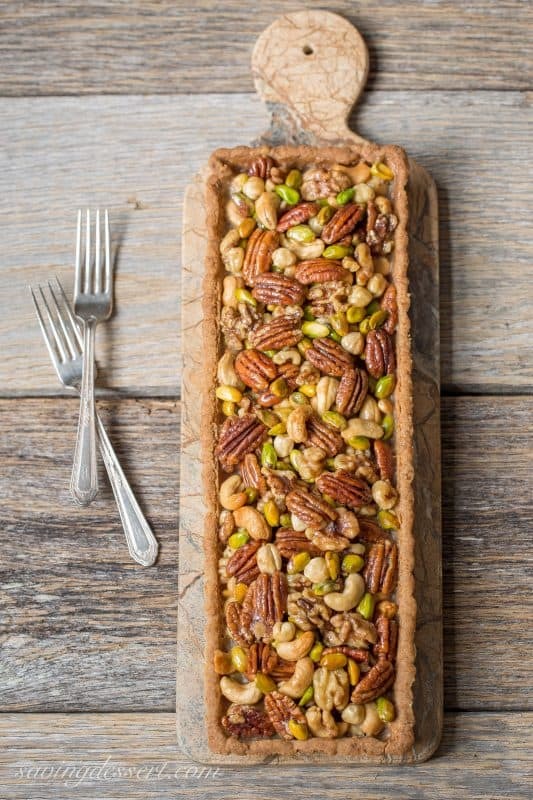 Wow, this nutty tart looks amazing! Congrats on 5 years! We too feel the same way about blogging and it’s been about 4 years for us. Make a wish! 🙂 Have a great week Tricia! Let’s celebrate 2 Sisters too! I love how we have all stuck together and grown and shared our very best. Take care and thank you very, very much! Happy Blog-anniversary!!! wow, 5 years….way to go. Beautiful nut tart Tricia! can you tell me a little about the pan you used, it is very nice. Thanks! Kudos on the 5 yrs..and my story is the same:)Started because a convincing friend told me I should..I thought I had nothing to say..and the years came and went.. THis is a goorgeous tart! I am in charge of desserts this TG weekend..and one of them is achocolate pecan tart..an oldie..sweetie..but goodie..not aure I would not have made yours instead.. Thanks Monique! 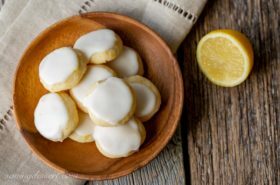 Never tried bourbon ever – or in a tart? This would be just perfect with vanilla instead – so feel free to adapt to your tastes. Bourbon is such an American/Southern thing – and I am a girl that was raised in the south. Bourbon and butterscotch and nuts just sounded great together and it is! Enjoy your week! I’ve been on vacation, so I’m eager to catch up with what you’ve been doing. Bur first, happy 5 years! Time flies, doesn’t it? I shudder when I look at my early photos! This tart is amazing — love the flavors. But anything with bourbon in it speaks to me. 😉 Thanks for this. We have missed you and Mrs. Riffs – so welcome back John! I hope you went somewhere fabulous and wonderful and maybe you’ll tell us all about it. Feel free to increase the bourbon in this tart – I am sure it will be fine! 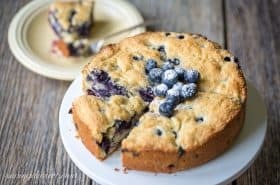 This tart is absolutely gorgeous! I love my long tart pan, but don’t use it nearly often enough. Happy blog birthday! This is so creative — and so perfect for fall! I love the long tart pan, too, I need to find one. But most importantly, congratulations on 5 amazing years, I’ve followed you from the beginning and you’ve always been an inspiration — here’s to 5 more years and a full time blogging career!! Hi Tricia – Happy 5 whole years of blogging! I am so happy to have been an audience to your beautiful kitchen creations and I’m glad you want to continue to do more so I’ll get to be a beneficiary. : ) It is always a pleasure to see your beautiful food – everything is always made with such a meticulous, professional hand. You truly inspire me! And you’ve stolen my heart with this celebratory tart. The nuts! I love all the overflow of nuts – and the bourbon, butterscotch, and buttery flavors of everything else together is to die for. It’s another great creation!